Pictured is The Elwing Company thruster. ...Swedish satellite manufacturer OHB Sweden, to partner in the development of advanced platform technologies for satellites. The Elwing Company has established itself as an industry leader in the development of electrodeless plasma propulsion technology, having pioneered breakthrough electrodeless propulsion technology and tested it comprehensively in the U.S. and Europe. Mr. Alain Demairé, Head of Propulsion at OHB Sweden, added “OHB is proud to have distinguished itself as the first satellite company to partner with Elwing in the deployment of its groundbreaking technology, which demonstrates our commitment to constantly exploring new and innovative technologies.” The Elwing Company conceives, designs, develops, manufactures and markets advanced propulsion systems for satellites. Established in 2002, The Elwing Company is privately held and has offices, affiliates and subsidiaries throughout the U.S. and in Europe. 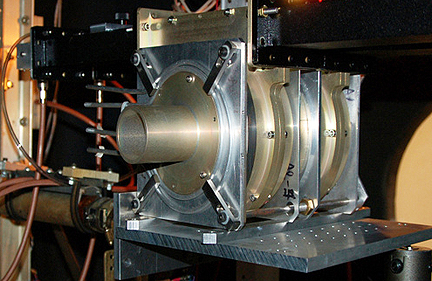 It developed and holds exclusive rights on the electrodeless plasma thruster technology.